What do you call it? A cacophony of road and rail closures? A collision? Or perhaps a conspiracy? Get ready for closure of the A5 overnight for three weeks. The A49 will be shut at Onibury 24-hours a day for ten days. Drivers will be directed via Kidderminster and Bridgnorth. 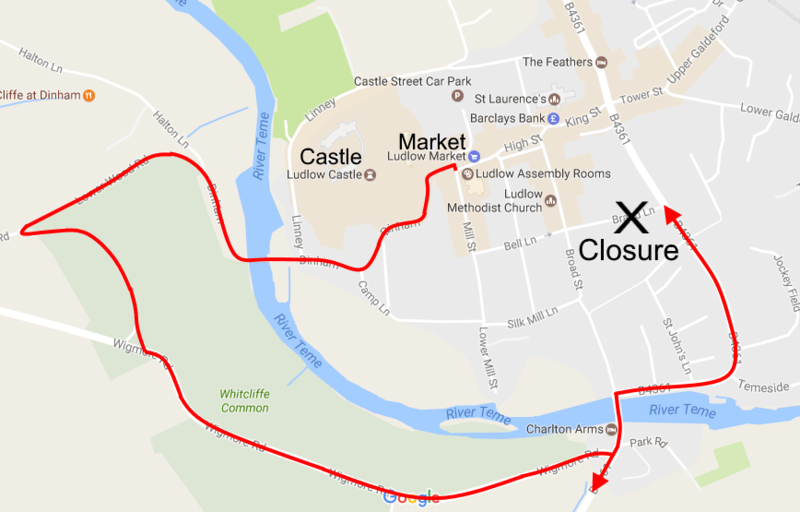 The main exit from Ludlow town centre will be blocked for three days, so HGVs and coaches will be sent over Dinham Bridge and Whitcliffe. South Shrewsbury is already often gridlocked as the “hamburger” – served without fries – is installed at Meole Brace and Reabrook roundabout is resurfaced. Arriva Wales is stopping trains between Shrewsbury and Crewe for five hours just because there is a football match on. That’s on top of two weekend line closures. This is truly a “chaos” of closures. Beginning furthest from Ludlow, the A5 will be closed overnight from 30 May to 7 July, with a 40mph limit during the day, between the Mile End roundabout at Oswestry and the Churncote roundabout near Shrewsbury. This is nicely timed for the summer school holidays. On 3 June, the last train to Crewe from Shrewsbury will be at 6.25pm and the next one is not scheduled until 11.30pm, according to the Star. The direct train from London to Shrewsbury leaves Euston at 18.23pm gets in at 20.55pm. Unfortunately, if you want to travel on to Ludlow, you will have to sleep on the station until the 7.10am bus on Sunday morning. That means a total homeward time of 14h 32m. Usually the train gets back to Ludlow around half ten in the evening, just in time for a swift half before retiring. Why is this happening? There is a football match in Cardiff. Arriva Wales are diverting their trains to carry supporters for that event. Across the country trains will be standing idle in sidings as many usually do on a Saturday. But our rail system has been broken into fragments by privatisation. It would presumably cost Arriva Wales a fair bit to hire trains from other companies – though I am surprised the company did not do so at a point where its franchise is up for grabs. Usually when train services are suspended, replacement buses run. There are rail closures planned between Hereford and Shrewsbury for two weekends, 17/18 June and 24/25 June. For these at least, replacement buses will run. In Shrewsbury, work on the Reabrook roundabout continues until the end of June. Diversions during reconstruction of the Meole Brace roundabout will also last until the end of June. We are getting close to Ludlow now. As close as Onibury. The level crossing here has been troublesome for a good while, with weekend and overnight closures for essential work. Now it is going to closed 24 hours a day from 1 July to 10 July for repairs. This work is for safety. The real problem is the diversion. Network Rail is proposing that traffic is diverted from Woofferton, via Kidderminster and Bridgnorth. That’s a 57-mile journey taking 1 hour 33 minutes, compared to the usual journey up the A49 of 31 miles taking 44 minutes. There is an alternative route via Culmington that has been used before. It was, for example, used by Highways England while resurfacing the A49 last year. This is just two miles longer than the A49 route. This diversion will disturb the residents of Culmington village. But the route via Kidderminster could damage the economy of towns along the A49, including Ludlow, that benefit from passing trade. Indeed, Culmington is the diversion that Network Rail wanted to use. But Shropshire Council has ruled that traffic should not be diverted via Culmington. This is after complaints by residents after diversions through the village last year. The council did not consider the impact that diversions via Kidderminster and Bridgnorth would have on the economy of towns like Ludlow, Craven Arms and Church Stretton. This is rather typical of Shirehall, which has repeatedly shown that it does not understand how the economy of South Shropshire works. It is high time that the council had a duty to consider the economic impact of all its decisions. The other issue that Shropshire Council does not seem to have considered is that roadworks commence on the Bridgnorth bypass on 4 July. Long delays and diversions were expected even before the diversion around Onibury. There is one more road closure planned. Again, it will hit Ludlow’s trade. Brand Lane will be closed for three days on 5-7 June. This is the main exit from the town centre and the only one suitable for HGVs and coaches. The plan is to divert traffic along Dinham and over the Whitcliffe. That is frankly crazy. This work is to install electricity and water connections to a new house being built on Brand Lane. I cannot see why this work can’t be done in one day. But we have witnessed this before. Too often, one set of workers comes along to dig a hole. With luck, they also do the repairs or installation. Another group arrives to fill the hole in and, at some point, contactors arrive to lay and roll the tarmac. My observations from Ludlow are that most of the time during which repairs and installations are underway, there are no workers on the site. On Thursday, Shropshire Council appointed a new portfolio holder for transport, Councillor Steve Davenport. He has already said he will be looking at the Onibury closure. I have asked him to look at the Brand Lane closure. I hope that he will also review the effect this chaos of road and rail closures will have on the south of Shropshire. He should also find ways to speed up roadworks and coordinate closures across the county.
. There is no information about this on the Highways England website.
. If you are travelling, check these times as Arriva Wales and Network Rail suggest the last train from Crewe to Shrewsbury (also to Ludlow) on 3 June is at 19.10 instead of at 23:14 as on a normal Saturday. Rail closure from Shrewsbury to Newport on Sun 10th June too – bus replacement. Do you know whether the trains will be running through Onibury during the rebuild of the level crossing or are they shut down too? Obviously if the level crossing is being rebuilt it seems obvious that they can’t run, but I wondered if they may do one side of the track at a time or something. It’s crazy! Arriva Wales have updated their website. Buses will run between Hereford and Shrewsbury at weekends on 1/2 July and 8/9 July. The full overnight closure of A49 between Woofferton and (Ashford) Bowdler. To allow carriageway resurfacing work. Closure will be total, in both directions. Closure taking place on unstated date(s) between 22 May and 8 July from 20.00 and 06.00 hours. NO … it is NOT a “chaos” of closures. It IS a CON of closures. And God help us at our A458 5-way junction in Wenlock. Is there any way I can “share” this article from my FB page?